A student loan may not always be part of the picture when planning for college, however for many families, borrowing student loans for college is the reality. If this is the case, hopefully a lot of soul-searching and research enters into the decision if you go the loan route. Being an educated consumer and knowing as much as you can about the types of loans available, the terms, and the lenders, can help you get the best rate possible and potentially alleviate financial pressures for your family. Can we get an overview of what a student who’s been approved for a loan needs to know? At this stage of the game, you’ve received your financial aid award letter (and if you have not, please call the school). The school received the information from your FAFSA and they were able to determine what the family’s EFC is, and that information was used to determine what type of need-based aid the student is eligible to receive as a result of the family’s income. The award letter will reflect all of the “free money” (aid awards that don’t need to be repaid: grants and scholarships from the school, and grants and scholarships from outside sources). Gift monies come together and are eventually subtracted from the COA (cost of attendance). Usually, whatever is left over is referred to as the “gap.” (Best case scenario is that the gap is a reasonable amount of money.) The next step to consider is the strategy the family would have to take in order to handle the gap and any other additional costs they can’t meet. How does the college award financial aid? Colleges have a formula. Presuming there is need after the free monies are taken into consideration, the school typically first awards a Direct Stafford Loan (Federal) to the student, and those funds come directly from the Department of Education. That amount is $5,500 (for freshmen), and will go directly to the school into the student’s account. Keith’s Tip: It would be foolhardy to forgo the Direct Student Loan in lieu of a Parent Plus Loan or a private student loan. Students may need the other loans as well, however, they should always max out the Direct Student Loans from the government prior to moving on to others. What does the typical financial aid “package” look like? Usually, aid is never from a single source. It is a conglomeration of bits and pieces of grants and scholarships from the school, and grants and scholarships from outside sources. How will we know when the funds will be disbursed? Keith’s Tip: There is very limited information that the school can release to parents, spouses, grandparents, etc., in order to protect the student’s privacy. Students can sign a waiver to release this info, and should be asked to do so. This should be done EARLY in the process so that you don’t run into an administrative snafu at the last minute. How long does it take for the loan application process to be completed? Best case scenario: A student (and cosigner) can come in and complete the application within minutes. (CommonBond can approve loans immediately, depending on receiving certain information, and they can then convey that information directly to a college’s financial aid office.) BUT, there is no guarantee that all applications will be processed that seamlessly (some applicants may need to submit additional documents and that can slow down the process), so it is wise to begin the process EARLY…like NOW! Why does my student loan need to be certified? In order for reputable lenders to be comfortable with providing their customers the best (and lowest) rates possible, they need to be assured that the customer is a “good risk,” so to speak. One of the ways they can do that is to develop a relationship with the financial aid office of a school and have that school confirm information about the student regarding their enrollment details and whether that student will rightfully require the amount that is being requested. By certifying student loans, lenders also request confirmation that the funds will be going to the right place. Students who are certified by the college have the best repayment histories, and thus can be offered better rates by the lenders. It’s basically a win/win situation for everyone. Keith admits that in addition to CommonBond, there are many other companies that provide good loan products. There are some lenders, however, that do not require loan certification, so make sure your lender does. How many days is the right to cancel? Approximately one week. There are some variations, however, that can range from 3 to 10 days. Which loans can be paid while a student is still in school? Keith’s Tip: It is really important to have a long vision in terms of college financing. Don’t think of funding as “year 1” or “year 2,” but as a long-term matter. Remember that you will be paying for college for 4 to 5 years, and consider the total, not the incremental costs and your family’s financial situation, especially if you have other children who will eventually be heading down that same path. Can an aunt cosign a loan? 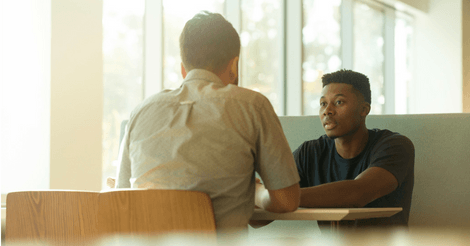 Teens generally do not have an established credit history, and it is for that reason that there are very few loans that are offered to students with no cosigner. Adding a cosigner who does have a stellar credit history is a good way to make sure the borrower will be offering the best rate possible. It’s important to bring in those stakeholders. If an aunt is a solid cosigner, then yes, she can absolutely be a cosigner. Why would someone forego the Parent Pus Loan for a private student loan? The Parent Plus Loan offers a fixed interest rate of 7.6%, and the fee structure is 4.248%. This makes the APR for the loan closer to 8.5%. This is a fixed rate for everyone, regardless of credit history, thus the cosigners are not able to compete for a better rate if they choose this type of loan. Private lenders also offer benefits like no pre-payment penalties if a student would like to accelerate their payments. There are also a variety of forbearance options offered as well. What should we look for in a private student lender? Aside from researching their products, a prospective borrower should inquire about a private lender’s customer service policy. Questions about with whom the borrower will have to deal should be addressed. CommonBond’s Customer Care Unit is based in the United States and is located on both coasts so that they can deliver equitable-based service in different time zones. Customer service is provided for the life of the loan and in all years of repayment. How the borrower will be treated for what might be ten to fifteen years should be a consideration when shopping for loans. When does the borrower find out who services their loans? Both Federal and private loans use companies who service those loans. Federal loans are assigned by the Department of Education to a servicer (could be FedLoans Servicing or FannieMae among others). You will be aware who the servicer on your loan is at the time that the disclosures are made at the time of the disbursement. Keith’s Tip: You will get communication about this via snail mail, so open those letters! We didn’t get the full $5,500 in subsidized and unsubsidized loans. Why? You have to “drill” into what the cost of attendance is at the school and what the other aid that’s coming in is. If the COA minus the other aid (free monies) results in a net amount that is lower than $5,500, then you will only be eligible to borrow the net amount. The amount will be for only what the school determines are allowable costs. Keith’s Tip: If you don’t get what you determine to be the “correct” subsidized amount, you can go back to the college and appeal. This can only be done if your additional costs are justified and have not been built into the COA. Does it make sense for a family to take all of the subsidized loans that are offered to make sure student has enough for all 4 to 5 years, and then pay back the loan immediately after graduation? Since interest is deferred, if a family has the resources to pay the amount due on a rolling basis and there is security in that income, it does not make sense to take on that debt. But, for families who are unsure about their future, then it is definitely recommended that they go for that loan. (Remember that the funds go directly to the school.) In addition, it gives the student the opportunity to develop some credit as well. And that is a positive! The financial aid office said there’s a maximum to the Parent Plus Loan, so we need to take out a private loan. Thoughts? Parent Plus Loans do not have a cap or limit…in theory. The limit is the available costs that need to be covered by the school. The school determines this cost, and in some instances it may not align with the realities of the student’s needs. If this situation occurs, you can appeal. However, the problem is that the limit will still be there and the school will not certify any loans that will be attempted to cover that cost. If an appeal is made, it must be VERY specific and include actual, specific data to back it up.